So you wanna be a RTO? So you want be a Radiotelephone Operator? This Information came from the Vietnam Database website run by Graham Sherwood. That site is no longer on the web, so I've made the information available here. Thanks to Dave Stieghan for saving a backup copy of this info. This has got to be one of the most complicated of roles within a squad or platoon. You have to know radiotelephone procedure, carry a heavy radio with all your other equipment and know how to use it under fire. The RTO's role is very important as you are often the only way of communicating between other squads and your headquarters. To learn radiotelephone procedure will take you a very long time and even in the army they do a minimum six week course. At least within a squad or platoon all you have to do is follow your platoon leaders around like a dog and do as he says. If you intend to be or are an RTO already, you will be expected to buy your own equipment. I have included some useful articles on using, maintaining and getting a radio to work and this will mean finding a battery solution. Big tip for you: Take a notepad with you and write down your orders before communicating them, this is authentic and will help you loads. So you want to be a RTO? Here I have listed the what I think you should have in your collection to display a basic RTO in the US Army in Vietnam. This includes your would be dual role as a rifleman if the situation arose, so it suggests the likely weight you will be carrying on any given patrol. Mind you this is what I think, so you don't have to go along with it. At the end of the day its up to you what you carry and how much weight you assign yourself. Jungle jacket, trousers, M1 helmet with cover, T-shirt, socks, undies, combat boots. 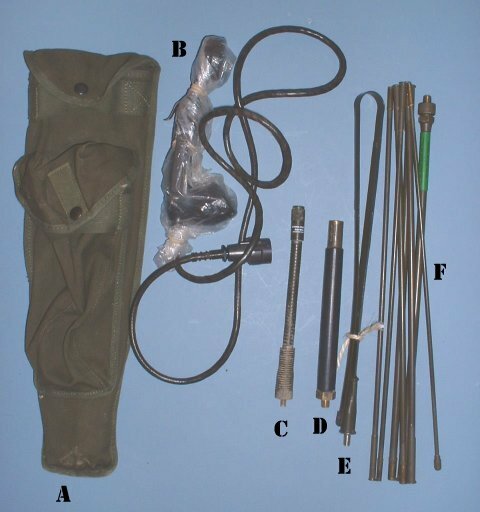 Standard System Webbing: This is belt, suspenders, two ammo pouches, two canteens with covers, buttpack (Optional), compass pouch. Radio accessories bag: Containing long and short antenna, antenna springs, handset. Radio harness either webbing type or carrying type. The basis of 'The Look' topic is to give you an idea of what an RTO looks like and what he might be wearing. 'The Look' is exactly like a rifleman accept you have this great big radio strapped to your back. The notes below are a few outstanding issues that I best think are suited to this topic and are closely connected with an RTO look. You will need to find a solution that best suits you to carry your radio and this is likely to mean some kind of harness. PRC-10's generally come with a standard carrying harness. This is one, which was designed to attach directly onto the M1943 suspenders. I have found this a very awkward way of carrying the Prick 10 so I've adapted mine so that it becomes a harness in its own right. There is a specific harness available, however I have not come across one yet. PRC-25's has its own designed harness with good back padding. It also has webbing hooks where a buttpack can be hung off it. Both the PRC-10 and 25 can be mounted on the Lightweight Tropical Rucksack Frame with the use of a radio-mounting shelf. This provides plenty of hanging space to attach all of your other necessary equipment. Unfortunately these are extremely hard to obtain and I have not seen any re-enactors with one of these yet. Actually this is quite authentic since these shelves were also very hard to obtain in Vietnam. In the early years of the war, PRC-10's and 25's were mounted on WW2 Packboards. These are much more comfortable than the previous M1943 harness and the US Army used them to allow soldiers carry more equipment with them. Attach a radio using Paracord or general purpose straps. The radio mounts on the back just like a backpack. Often it was mounted so that the attached antenna fell on the operators left shoulder. The antenna could be bent over his shoulder and secured through the top suspender harness. This, of course, was only possible with the short fully flexible antenna, but did reduce the chances of it getting caught in passing foliage. The second reason for bending the antenna over was to avoid drawing unnecessary attention towards the operator. The handset on the right was looped under his arm and hooked on the right shoulder suspender harness. Personally I prefer it the other way round, but only because I am left ear dominant. RTO's were a target for the enemy and with a large block on your back they were easier to spot. Common practise for RTO's was to mask or change the silhouette of the radio. This was done for example attaching a machete on the side and hanging other bits of equipment on it like claymore mine bags and grenades. The radio, whilst fun to use, is unfortunately very heavy and at over 25 pounds gets very tiresome over long distances. I would suggest that prospective RTO's get themselves in the first instance a good pair of comfortable jungle boots. Your feet get the real beating, so you need good boots. Remember that much of the time you will be carrying at least 60 pounds on you (Including radio, batteries, webbing etc. ), so watch your step. It's not hard to twist your ankle with that amount of weight on you. Make your carrying harness as padded as possible. You can always improvise with a field towel wrapped around your shoulders or suspenders. A common tip in Vietnam was to wear a flak jacket like the M1952. This although very hot to wear will spread the weight a bit. Combat load means you would be carrying all your usual rifleman's equipment plus a radio. This isn't too much of a problem; however, full load is another deal altogether. RTO's basically carried everything a rifleman would have plus a radio and its extra accessories for a 36-hour period. This means spare handsets, antennas, and as many batteries as you think you will need (Two spare batteries does the trick fine). In Vietnam, batteries were one of those things that came on every supply chopper, but in re-enactment you won't have this luxury. If you can find a Packboard, then use this to attach your radio and other equipment. The PRC-25 has its own dedicated harness that can allow a buttpack to be fitted to the bottom. I have seen other RTO re-enactors use these with claymore mine bags attached and they seem to be able to carry everything they need. I would also recommend that you make friends with someone fast and get them to carry some of your stuff! This is probably the fist section you should look at, actually knowing your radio, what parts do what, how to work it, when to use the whip etc.. If you know all this then you don't need to look any further, but if you don't then it might be a good idea to read on! This radio set (Pictured) is a PRC-10 and its controls are identical to the PRC-25 and 77. Below is a list of its controls as written on the radio set. Great! So what do they all do? Ahh... now this is when it gets fun! First you need to see the radio set accessories. These are pictured and listed below. Ok....so now tell me what they all do? There are three antenna connectors on you radio and this is one of them. This connector attaches the 10 feet long multi section whip antenna, folded up and labelled F in the accessories picture. You should note that any flexable antenna is called a 'whip'. But before you can connect it you need to attach the antenna spring (D, [ii]). This is a semi ridged shock abosrber designed to take the strain if the the antenna comes into contact with an obstacle. This is especially useful if you have a radio mounted on a vehicle. This connector attaches the shorter 3 foot long semi-rigid steel tape whip antenna, labelled E in the accessories picture. Like the long antenna you need to attach the shock absorber, antenna spring (C, [i]). This is similar to the long antenna spring accept that it is far more flexable and can bend right over itself. This is ideal when you are carrying the radio on your back through difficult terrain. This is for a smaller auxiliary homing antenna that assists in the tuning of the radio, though I have never seen it in use. The main tuning dial D tune the radio to the desired frequency. The pointer adjust fine tunes the main tuning dial. This is operated by a smaller dial wheel. This locks the main Tuning dial (D) so don't attempt to turn it with it locked. This connector is to attach the handset to the radio. It attaches by places it over the three groves and with a push and turn to clockwise it locks it in place. You can also attach a loudspeaker to this same connector for clearer radio communications. This is especially useful when noise security isn't paramount. This is the volume control and adjusts the volume to the handset or loudspeaker. The Squelch circuit grounds the audio output and silences (Squelches) the receiver (Handset or Loudspeaker combination). In operation it works a little bit like a noise gate on a guitar amplifier. Power Switch at Off. When this switch is at OFF no power is supplied to the radio set. Power Switch at On. At this position fhe radio power is supplied to the radio set and this puts the receiver in operation. Power Switch at On, Push-to-talk Button Pressed. When the push-to-talk button is pressed it disables receiver. operates the transmitter and activates the handset microphone circuit. Power Switch at Cal & Dial Lite. When at this position it is the same as the On position accept that it illuminates the dial lamp. The position of the switch is spring loaded and so the switch returns to the On position when released. Note: The Lite Cap on the radio set unscrews to reveal the dial lamp. This provides easy replacement of the bulb when needed. Power Switch at Remote. When the switch is at Remote, power can be applied to the receiver-transmitter only through the control group AN/GRA-6 which is used for remote control. WTF! I have no clue here, I even have the manual in front of me. Perhaps someone could enlighten me. This is a summary of the above section and instructions for basic operation and also in case you didn't bother reading it. Dont' play around the controls when the radio is off, apparently this can f@*k it up. First make sure the Volume and Squelch controls are set to zero and the power is set ot off. Connect the antenna and handset. Do this before you switch the radio on. Then connect the battery (Haven't got a battery! Well don't worry as this is covered in another section). Next, (And this is quite important) allow the radio set to warm up. 15 minutes should do. Remember this is old equipment and needs time for everything to start working. Tune the radio to the desired frequency. Push the handset button to talk (Transmit) and release to receive. To turn off, reduce the Volume and Squelch controls back to zero. Then switch the radio set off. Before you operate any radio set, get the equipment Field or Technical Manual (FM or TM) and carefully study the operating instruction. Refer to the panel diagrams, connections diagrams, and the paragraphs covering the description of components during the preliminary starting procedure. Make sure that the proper cables are connected to the proper panel connectors, and that the controls are correctly set. Even if you are experienced with these radios you should check their preliminary procedures against the FM references from time to time to insure accuracy and to avoid damage to equipment. Make sure that all the necessary components and accessories are on hand and ready for use. Never operate the transmitter without the antenna attached. Inspect the Condition of the Knobs, Dials, Switches, and Controls. Look for knobs, dials, switches, and controls that are loose on their shafts, bind when being operated, won't operate, or are damaged in any other way. Make sure that all knobs and exterior parts are on the set. Check the Condition of Plugs, Receptacles, and Connectors. Make sure the plugs and connectors are clean and in good condition and that the receptacles to which they must be connected are also clean and in good condition. The radio set may be damaged if cables are connected to the wrong receptacles. If the connectors don't match, it is possible to physically damage the pins or sleeves of the connector. If a cable is connected to a receptacle into which it fits but does not belong, it may cause serious electrical damage to the equipment and, in some cases, injury to the operator. Don't play around with any of the knobs or controls until there is a power source attached and the set is on and warmed up. Otherwise you can damage or cause misalignments in the radio. These early radio sets can be seriously damaged if the switches, dials, and controls are not set to the required initial settings before applying power or making the initial timing adjustments. Before applying power, check the equipment field manual to be sure you performed all preliminary starting procedures. Be sure radios installed in vehicles are turned off before starting vehicle engine 80 as to avoid damage to radio equipment. Make sure you understand the proper procedure for starting the radio set. If there is a specific sequence for starting the set, it is described in the manual. Perform the operations in the proper sequence. If you don't have a manual get one. There are many available from Internet auctions such as ebay. After the proper connections are made and all switches are properly set, power may be applied to the set. Allow the Set to Warm Up. These older radio sets usually require a warm-up period when first applying power in order to stabilize the equipment. In some cases, it is possible to damage a set by attempting to operate a set without allowing a warm-up period. It is foolish to risk damage to a radio set by trying to put it on the air before it is ready. Tune to the Desired Frequency (Channel). Use the methods that are given in the FM to check for correct tuning. If anything unusual occurs during operation, investigate it immediately. When necessary, turn off the power to the set and refer to the FM and the equipment performance checklist in the equipment manual. After operation (or if the set is being turned off because of improper operation) make sure that the controls, switches, and dials are properly set (this may not be required on some radios). Proceed to shut down the components of the set in the sequence specified in the equipment manual. Simple radios may require nothing more than turning the power switch to its off position, but more complex sets may require elaborate shutdown procedures. · Antennas should be located in clearings on the edge farthest from the distant station and as high as possible. · Antenna cables and connectors should be kept off the ground to lessen the effects of moisture, fungus, and insects. This also applies to all power and telephone cables. · Vegetation must be cleared from antenna sites. If an antenna touches any foliage, especially wet foliage, the signal will be grounded. · Vegetation, particularly when wet, will act like a vertically polarized screen and absorb much of a vertically polarized signal. Patrols and units of platoon and squad size can greatly improve their ability to communicate in the jungle by using the longer whip antenna. While moving, you are generally restricted to using the short flexible antenna that comes with your radio. However, when you are not moving, these expedient antennas will allow you to broadcast farther and to receive more clearly. Keep this fact in mind; however, an antenna that is not "tuned " or "cut" to the operating frequency is not as effective as the whips that are supplied with your radio. Circuits inside the radio "load" the whips properly so that they are "tuned" to give maximum output. If you haven't got the long antenna you can fabricate a complete expedient antenna by using field wire, and other readily available material. You can use almost any plastic, glass, or rubber objects for insulators. Dry wood is acceptable when nothing else is available. · Use a handset or headset, rather than a loudspeaker, if the incoming signal is weak. · Make sure that the microphone or handset is in good condition. Speak directly into the microphone; speak slowly and distinctly. · Make sure that the vehicle's battery voltage (if radio set is vehicular-mounted) is within the correct range. Keep the engine running to charge the battery. · Move the set or the vehicle, if necessary, to improve reception. · Too great a distance between radio sets. · Poor choice of location (siting) at one or both ends of the circuit. · Not enough transmitter power. · Improper adjustment of equipment. · Study the technical manuals for the equipment you are using. They provide complete operating instructions and maintenance procedures. · Keep your radio set clean and dry. · Handle your radio set carefully. I would have loved to have done an article on basic and advanced maintenance for when your radio breaks down. However, these radios are so complicated and the equipment needed to fix them so rare, it becomes an impossible task. Instead this section deals with preventative maintenance i.e. using your radio in a way that reduces the situations where it might break down. Radio communications in "jungle" areas must be carefully planned, because the dense jungle growth significantly reduces the range of radio transmission. Limitations on radio communications in jungle areas stem from the climate and the density of jungle growth. The hot and humid climate increases the maintenance problems of keeping equipment operable. Thick jungle growth acts as a vertically polarised absorbing screen for RF energy that, in effect, reduces transmission range. Therefore, increased emphasis on maintenance and antenna siting is a must when operating in jungle areas. Straight out of the field manual, but makes sense whatever climate you are re-enacting in. Keep the equipment as dry as possible and in lighted areas to retard fungus growth. Keep all air vents clear of obstructions so air can circulate to cool and dry the equipment. Keep connectors, cables, and bare metal parts as free of fungus growth as possible. Put a clear plastic bag over your handset or headset to guard against moisture. The effect of extreme weather conditions on wet and dry cell batteries depends upon the following factors: the type and kind of battery, the load on the battery, the particular use of the battery, and the degree of exposure to differing temperatures. Generally keep your batteries dry and free from moisture, preferably in plastic bags. Damage may occur to your radio if you engage in energetic gymnastics, summersaults and back flips etc. Refrain from throwing your radio around. Moisture from your breath may collect on the perforated cover plate of your microphone. Use standard microphone covers to prevent this. If standard covers are not available, improvise a suitable cover from plastic bags or cellophane membranes or from nylon cloth. A radio set generates heat when it is operated. When you turn it off, the air inside cools and contracts and draws cold air into the set from the outside. This is called breathing. When a radio breathes and the still-hot parts come in contact with subzero air, the glass, plastic, and ceramic parts of the set may cool too rapidly and break. When cold equipment is brought suddenly into contact with warm air, moisture will condense on the equipment parts. This is called sweating. Before cold equipment is brought into a heated area, it should be wrapped in a blanket or parka to ensure that it will warm gradually to reduce sweating. Equipment must be thoroughly dry before it is taken back out into the cold air or the moisture will freeze. Overnight condensation can occur wherever surfaces such as metals exposed to air are cooler than the air temperature. This condensation can affect such items as electrical plugs, jacks, and connectors. All connectors likely to be affected by condensation should be taped to prevent moisture from contaminating the contacts. Plugs should be dried before inserting them into equipment jacks. Excessive moisture or dew should be dried from antenna connectors to prevent arcing. Trying to get your radio to work can be a problem since it is very hard to obtain the originial batteries in working condition, and then you have the problem of trying to charge them. 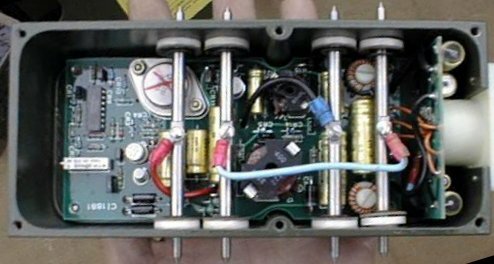 This section deals with solutions to those battery problems you may have for your PRC radios. Luckily supplying a battery for your radio is not as impossible as you might have thought. The only radio that is difficult to obtain a solution for is the PRC-10. 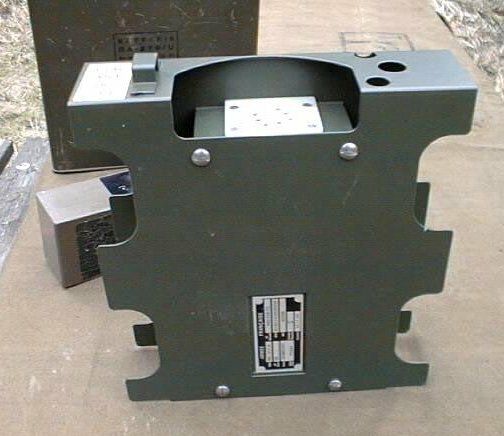 The PRC-10 Radio Originally used a large BA-279/U battery, contained within the lower battery box. These batteries are no longer available. Fortunately the French Army were using PRC-10 radios in the 1980's and had the same problem. They came up with a power converter that could be fitted inside the battery box and could convert French made batteries to work with this radio. These French batteries are not available, but that doesn't matter. The Power converter BA-511A can work with any combination of batteries which together produce 24-30 Volts.The batteries that can be used are Dry, sealed / Rechargeable batteries, as used on Alarm panels and security systems. These batteries come in different sizes and power ratings. You can use two 12 volt batteries in each side of the power converter (space permitting in the battery box). The higher the Amp / Hour, the longer the batteries will last between recharges. These type of batteries come in different sizes. and you want to find the biggest ones that you can fit inside the battery box with the power converter. 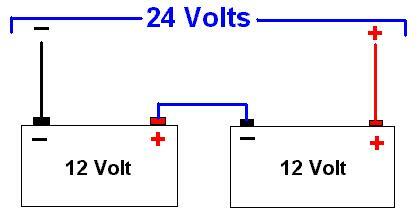 The two batteries are wired in series to make 24 volts see diagram below. If the batteries don't quite match up, you may need to make some adjustments to the converter. If this is the case then take the BA-511A apart and remove the 4 pins that are held there by circlips. There are 2 wires a (- Black wire) and a (+ Red wire).You can use banana connectors as the power connectors, one red for (+) and one black for (-). Fix them through 2 of the holes that the pins used to be in. Then you can easily connect the batteries to the power supply and remove them for charging. Put everything back together less the pins. You dont have to use the metal surround, with out it you would have more room in the radios battery box. You have to connect the power supply to the radio otherwise it will not work. Remember the higher the capacity of your battery the longer they will last, but you are only limited to the size of the battery and removing the metal surround means you may be able to use a larger battery. Don't forget you have more space if you remove the converters frame and the pins, so you may need to put some padding inside to prevent it rattling around. Where can I get one of these converters? Try Army Radios for starters. Otherwise you can usually pick them up at Militaria Fairs. Where can I get these Batteries? Try your local security company or a electronics surplus store for the batteries. Or search on the internet for "Alarm Batteries"
These batteries are not expensive and cost around £10 or $15 each. You can charge these batteries with any odd 12 volt battery charger. A car battery charger would do nicely. These radio sets has several solutions. It is better that you go to the following sites, which contain very good solutions for all your battery needs. Radiotelephony is a system of telecommunications that is used for short-distance tatical communication between highly mobile units. To use your radio authentically as they did in Vietnam you will need to know the operating rules. Most of these rules will take you some time to learn, but are critical to getting you to sound like a real RTO. The simplist of the rules as advised by the manuals are to listen carefully, speak in natural phrases (Not word by word) and speak slowly and distinctly. If you are really not sure what you are doing the least you can do is use the appropriate message procedure. When you have finsihed your message you say "OVER". OVER is used at the end of every section of a message when a reply is expected. If listening to someone you would say nothing until you heard "OVER". When you have finished all messages you say "OUT". To avoid confusion and errors during voice transmission, special techniques have been developed for pronouncing letters and numerals. These special techniques resulted in the phonetic alphabet and phonetic numerals. The phonetic alphabet is used by the operator to spell difficult words and thereby prevent misunderstanding on the part of the receiving operator. The words of the phonetic alphabet, which is a word alphabet and not a code, are pronounced in the tables below. 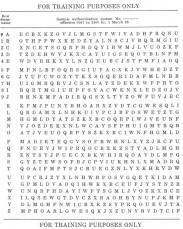 The phonetic alphabet is also used for the transmission of encrypted messages. For example, the cipher group CMVVX is spoken "CHARLIE MIKE VICTOR VICTOR XRAY." Numbers are spoken digit by digit, except that exact multiples of thousands may be spoken as such. For example, 84 is "AIT FOW ER", 2,500 is "TOO FIFE ZE RO ZE RO," and 16,000 is "WUN SIX TOUSAND." The date-time group is always spoken digit by digit, followed by the time zone indication. For example, 291205Z is "TOO NIN-ER WUN TOO ZE-RO FIFE ZOO-LOO." Map coordinates and call sign suffixes also are spoken digit by digit, but these were often disguised by numbers (See Shackles). To keep voice transmission as short and clear as possible, RTO's used procedure (Pro-words)words to take the place of long sentences. The table below contains all the Pro-words you will need. This is the reply at a challenge to Authenticate. This transmission is in error, disregard it. The following is my response to your instructions to Read Back. That which follows has been varified at your request, and is repeated. There is more of the message to follow. Your message to to fast to understand, speak slower. Your last transmission was wrong. In Vietnam standard Alpha code three letter groups were used. These were similar to Pro-words, accept they were in basic code. Each three letter groups could mean a word or sentence. These codes are kept by the RTO or Platoon Leader in the Signal Operating Instructions (SOI) and this could be changed daily. For re-enactment purposes you could keep it the same. A standard Alpha code could be ROMEO PAPA ALPHA. This may translate to "Rally with us at Base Camp". The Police use a similar system, thus you may have heard GOLF LIMA FOXTROT, meaning "Go Like F##K" i.e. get there quickly please. Two types of codes are normally used in tactical communications: Security Codes and Brevity Codes. A code used to hide meanings from another party is a security code (These included 3 letter Groups and Shackles). A code used to shorten transmissions is a brevity code. For example LZ is a brevity code for Landing zone. A brevity code only shortens transmission; it does not provide security. Lists of these codes are referred to as a brevity list. In Vietnam they used something called SHACKLES. These were 10 letter code words for 0 through to 9 to translate to map co-ordinates. So the numbers 0-9 were represented by letters and those letters were read out as radio alphabet and always as a 10 letter word. This is similar to I SPEll but with a a basic form of security code. ECHO, CHARLIE, LIMA, EHCO, WHISKEY, SIERRA, CHARLIE, WHISKEY, WHISKEY. These codes were probably also changed on a daily basis. The Platoon Leader or the RTO would carry the Signal Operating Instructions (SOI) which contained the frequencies and call signs of all units in the area and day codes. This enables you to send and receive coded messages. The SOI provides the organisation of stations into nets, assigns call signs, designates net control stations (NCS), and assigns frequencies. It also provides information on changes to alternate frequencies and on authentication. In addition, the security procedures that must be used by radio operators in the command are included in the SOI supplemental instructions. The company commander or the RTO would carry the Signal Operating Instructions (SOI) which contained the frequencies and call signs of all units in the area and day codes. This enables you to send and receive coded messages. The SOI provides the organisation of stations into nets, assigns call signs, designates net control stations (NCS), and assigns frequencies. It also provides information on changes to alternate frequencies and on authentication. In addition, the security procedures that must be used by radio operators in the command are included in the SOI supplemental instructions. If you are an RTO then it would be advisable to create a pocket sized SOI for yourself. Decide which callsigns and frequencies you will use and the authentication send and reply codes. Make sure this book doesn't fall into enemy hands! Call signs are used in radio communications to identify a communications facility, a command, an authority, or a unit. There are two forms of call signs: Complete Call Signs and Abbreviated Call Signs. Complete call signs usually consist of a letter - number - letter combination and a suffix, or a name and/or number. These are used when entering a net in which you do not normally operate. Abbreviated call signs are used at all other times. Platoon call signs were always two digit consecutive numbers such as 41, 42, 43, 44. Call signs also consisted of pronouncable words Red Fox, but they tended to get warped into weird and colourful names like Robin Hood and Boo Peep. If no confusion exists as to which operators are on the radio net, no call signs need be used. Each and every Battalion, Company, Platoon, and Squad had a radio ID. Radio ID's are based on the tables below. Take the 2-7 Air Cavalry Re-enactment group. They are, 2nd Battalion, Alpha Company, 1st Platoon and operate 1st and 2nd Squads. Their Radio ID's are 2 (2nd Battalion) ALPHA (Company A) LIMA (1st Platoon) 1 (1st Sqaud). When Platoons and Squad Leaders send each other messages, sometimes they are identified as a number. Thus if you heard "THIS IS RED FOX 6, OVER" you would be hearing Red Fox's commanding officer. The Commanding Officer or Senior Officer of a Unit is always a "6". Next in command is always a "5". Weapons squad leader is a "4". Third squad leader is a "3". Second squad leader is a "2". First squad leader is a "1". Combat experience in Vietnam proved that false radio communications by the enemy contributed to substantial numbers of casualties and caused many missions to fall short of desired results. Proper authentication procedures can prevent an enemy from posing as a friendly station. The enemy is adept at radio communications and needs only a moderate degree of skill to seriously affect communication when we do not authenticate. A balance has to be struck so that effective communications is maintained without harassment of friendly communications. Authentication is one of the best means available to stop enemy infiltration efforts. · Suspect a transmission is from an enemy station operating in the net (deception). · Direct a station to go to radio silence or to break that silence. · Are challenged to authenticate. · Give an early warning report, or issue any follow-up report. · Transmit directions, which affect the tactical situation such as "Move to..." or "Turn off the radio." · Open the net or resume transmitting after a long period of silence. · Transmit to someone who is under radio listening silence. · Transmit a classified message in the clear. · Transmit messages in the blind; that is, neither desiring nor expecting a reply. Challenge if you are not sure that authentication is required. If a station takes more than 5 seconds to authenticate, rechallenge. Why 5 seconds? Because an enemy operator may try to contact another station and have it respond to that same challenge, thereby obtaining the appropriate reply to your challenge. RTO 1: This is BULLDOG 6. 2 ALPHA LIMA 1, OVER"
RTO 2: "ROGER BULLDOG 6, AUTHENTICATE HOTEL LIMA, OVER"
RTO 1: "I AUTHENTICATE ALPHA, OVER"
RTO 2: "ROGER BULLDOG 6 THAT IS CORRECT"
RTO 2 has worked out the code from a simple authentication table like the one below. The letters A to Z, printed in the sequence on the left hand side of the table are the Row Designators. The numbers 0 to 9 also represent those letters. So that if either the two test elements are a number then the adjacent letter is used. E.g. if 4 is is part of the challenge, then E is used. 1) First locate the first test element, "H" in the colomn of Row Designators. 2) Scan across the row designated by "H" to find the second test element "L". 3) The first letter to the right of "L" is A. Therfore the challenged RTO would respond "ALPHA". If the second test element happens to be the last letter in the row, then use the first letter in the same row as the authenticator e.g. as if HO were used then the authenticator would be U. When challenging, try not use the same pair of test elements. Remember the enemy is alwasy listening. When you hear radio communications there's a lot of slang words being used, some of which won't be familiar to non-Americans. Here is some slang words and phrases that I've picked up that may come in useful when you are on your radios. For further Jargon refer to Abbreviations and Terminology. Points of view e.g. "WE GOT MOVEMENT AT 6 O'CLOCK"
Pronounced A-LUME A Illumination flare e.g. "IM FIRING A LUME, OVER"
e.g. "WE GOT CONTACT ON THE TREELINE"
E.g. "REQUEST ONE ROUND ELIMINATION"
E.g. "GET READY TO MOVE YOU'RE PARTY TO THE EAST"
e.g. "WE GOT MOVEMENT IN THE TREELINE"
e.g. "WE GOT MOVEMENT ON THE BUNKERLINE"
RTO 1: "GREYWOLF THIS IS BULLDOG 6. WHAT IS YOUR STATUS, OVER"
RTO 2: "BULLDOG 6 THIS IS GREYWOLF 3. STATUS GREEN. STAND BY FOR A SHACKLE. I SHACKLE ECHO, CHARLIE, LIMA, ECHO, WHISKEY, SIERRA, CHARLIE, WHISKEY, WHISKEY BREAK. NO CHARLIE FOUND, OVER"
RTO 1: AHHH ROGER GREY WOLF, OUT. RTO 1 Who we now know is the Commanding Officer has asked Grey Wolf what his status is. Grey Wolf is a 3rd Squad Leader and responds saying conditions are safe. He then gives his map co-ordinates. Bulldog acknowledges this and ends this piece of communication. RTO 1: "FLASH! 7-6-5-0 THIS IS 2-4. WE ARE UNDER FIRE, CONDITION RED REQUEST FIRE MISSION, SAY AGAIN CONDITION RED REQUEST FIRE MISSION OVER"
RTO 2: "AHH ROGER 2-4 FIRE MISSION AT YOUR DISCRESSION, OVER"
RTO 1: "AHH ROGER. YEH OK. BE ADVISED HOTEL ECHO ON YOUR POSITION, OVER"
ETO 2: "ROGER 2-4. WE'LL HOTEL ALPHA, MUCH ABLIGED, OUT"
Here RTO 1 gives out an emergency message saying he is under fire and condition is dangerous. He requests a bombing raid and repeats his request. RTO 2 acknowleges this and says that a bombing raid is at his discression. RTO 1 advises RTO 2 that there may be high explosives coming down in his area. RTO 1: "SKYLARK THIS IS GREYWOLF 6. REQUEST FIRE MISSION, OVER"
AIRCRAFT: "GREYWOLF 6 THIS IS SKYLARK CONFIRM POSTITION, OVER"
RTO 1: "SKYLARK THIS IS GREYWOLF 6. STAND BY FOR A SHACKLE. I SHACKLE PAPA, X-RAY, VICTOR, CHARLIE, TANGO, SIERRA, TANGO, ROMEO, FOXTROT, BRAVO, OVER"
AIRCRAFT: "AHHH ROGER GREYWOLF. ETA TANGO, OVER"
RTO 1: "ROGER SKYLARK I AM POPPING SMOKE, OVER"
AIRCRAFT: "I IDENTIFY PURPLE, OVER"
RTO 1: "RAJAR SKYALRK, I POPPED PURPLE, OVER"
RTO 1 then talks to an aircraft to find the nearest sortie. Skylark asks him to confirm RTO 1's position which he does by SHACKLE. RTO 1 then pops a smoke not telling the Skylark the colour (For security reasons). The aircraft reports what colour he sees and RTO confirms that that is the colour. This is not an extensive glossary for everything RTO. It is a few of the terms and words that would be useful to know. Removal of the energy from a radiated field by objects that retain the energy or conduct it to the ground. Loss of absorption reduces the strength of a radiated signal. The activity of individual to whom the message is to be delivered. The processes of increasing the electrical strength of a signal. A device used to increase signal power. It may consist of several stages of sections to obtain desired amplification. An electrical conductor or system of conductors, used to transmit or receive radio waves. An arrangement of antenna elements usually dipoles, used to control the direction in which most of the antenna's power is radiated. A form of acoustical energy that can be detected as sound by the human ear. The range of audio frequencies extends from 20-20000 cycles per minute. A security measure designed to protect a communications system against fraudulent messages. The line or route on which lie the starting position and probable future locations of the command post of a unit during a troop movement. The main route on which messages are relayed or sent to and from combat units in the field. A section of the frequency spectrum required to transmit the desired information, whether visual aural or both. The frequency of an unmodulated radio wave. The RF component of a transmitted wave upon which an audio signal, code signal, or other form of intelligence can be impressed. An electrical path over which transmissions can be made from one station to another. A communication link between two or more points. The headquarters of a unit or subunit where the commander and staff perform their functions. In combat, this headquarters is often divided into echelons. A communications agency charged with the responsibility for receipt, transmission and delivery of messages. This protection resulting from all measures designed to deny to unauthorised pesons information of value which might be derived from a study of communications. The relative ability of a material to allow the flow or passage of an elecrical current. Radio waves having a constant amplitude and constant frequency. A natural substance such as quartz or tourmaline that is used to control the frequency of radio transmitters. The date and time, expressed in digits and zone suffix at which a message is prepared for transmission. The DTG is expressed as six digits followed by a zone suffix. The first pair of digits denotes the date, the second pair the hours, and the third pair the minutes. The process of recovering the audio component (audible signal) from a modulated RF carrier wave. The amount by which the output waveform differs from the input waveform. Distortion may exist in amplitude, frequency of phase modulation. Duplex or full duplex operation refers to communication between two points, in both directions simultaneously. Variations in the strength of a radio signal at the point of reception. The number of recurrences of a periodic phenomenon in a unit of time. In specifying the electrical frequency , the unit of time is the second, for example, the frequency is 15,000 cycles per second. Radio frequencies are normally expressed in kilocycles per second (KCS) at and below 30,000 KCS, and in megacycles per second (MCS) above this frequency. A device that is calibrated to indicate the frequency of the radio wave to which it is tuned. The process of varying the frequency of an RF carrier wave in accordance with the amplitude and frequency of an audio signal. The relative strength of electrical, magnetic, or vibrational energy. Natural or man-made radiation of electrical energy that causes difficulty in reception of signals. Highly ionised layers of atmosphere existing betwen the altitudes of approximately 30 to 250 miles. Deliberate interference intended to prevent reception of signals in a specific frequency band. The part of an FM receiver that eliminates all variations in carrier amplitude, thus removing all noise present in the carrier as amplitude modulation. A medium by which a message is conveyed from one person or place to another. Any thought or idea expressed in brief form or in plain or secret language, and prepared in a form suitable for transmission by any means of communication. A system consisting of a number of designated stations connected with one another by any means of communication. The command by whose authority a message is sent. A band of adjacent frequencies having sufficient width to permit its use for radio communication. Any frequency of electromagnetic energy capable of propagation into space. Radio frequencies are much higher than frequencies associated with sound. The part of a headquarters which is principally concerned with administrative and logistical matters. The condition that exists in a circuit when the current voltage or power has reached maximum and cannot be increased by any normal action that controls the circuit. Any electrical disturbance caused by atmospheric conditions. The process of adjusting a radio circuit so that it resonates at the desired frequency.